Created to achieve the perfect balance of yield, strength and high, MiG-29 combines the legendary G13 Haze with a hand selected stabilised Ruderalis. MiG-29 is one of the AutoSeeds' largest yielding and most powerful super autos maturing in around 75 days from seed. The plant produces super crystalline buds thickly coated in resinous THC even extending down to the shade leaves. Despite the addition of G13 Haze to the cross, MiG-29 has indica tendencies thanks to the Ruderalis, with the haze working predominantly to improve the taste and complexity of the high. The taste is fruity and slightly spicy and the buzz is both a body and cerebral high. MiG-29 will thrive both indoors or out in a mix of climates and conditions thanks to its tough and hardy nature. 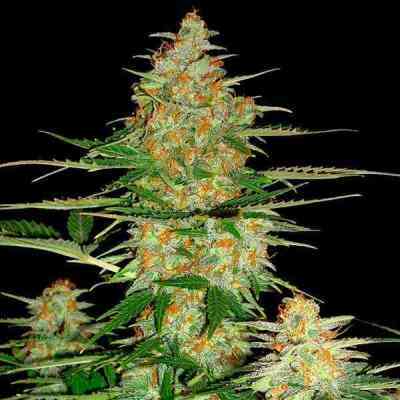 Under intense light or hydro setups the plant can reach 1 meter in height. If grown outdoors it is advisable to harvest when the sun is still strong (mid to late summer) to achieve best yields and maximum coverage of trichomes. Although you can harvest into October in warmer climates. MiG-29 lives up to its name and carries a powerful punch and stratospheric high.